The Venetian and Wynn continue to trot out quality fields and huge guarantees. In the past week, Wynn held their largest event to date as part of the Wynn Summer Classic and The Venetian made headlines for some controversy at their recent live streamed final table. The highest buy-in to take place outside of the Rio this summer in a non-high roller event brought 178 entrants to The Venetian. 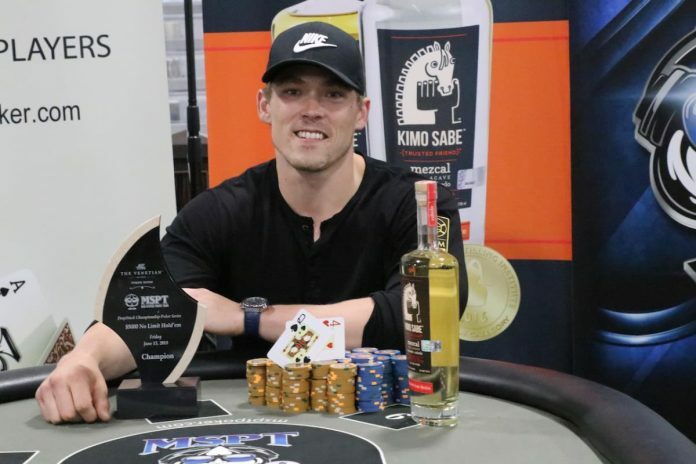 The $5,000 $1 million guaranteed Mid-States Poker Tour event produced as good of a final table as live stream viewers could ask for. Alex Foxen, Kristen Bicknell, Kahle Burns, and Jake Schindler headlined the event and all but Schindler were among the final three. After declining a chop deal with the couple of Bicknell and Foxen, Burns lost and earned a $120,000 bronze medal. England’s Conor ‘1_conor_b_1’ Beresford delivered fifth place and his largest cash of the summer. Foxen and Bicknell immediately chopped afterward and Foxen took home the trophy along with $239,000. Bicknell earned a quality $200,000 score. Accusations of soft-play and potential collusion filled the social media space during and after the event. The live stream indicated no blatant chip-dumping but the attention stays on that side of the aisle. Another six-figure was produced at The Venetian in the past week as Ben Jones won the $1,600 Six-Max $750,000 guarantee event outright. Jones beat Alexander Lakhov heads up to claim the $193,468 first-place prize. Lakhov settled for $109,138. David Jackson and Kevin Saul both made the final table while Jessica Dawley and Mike Del Vecchio placed at the final two tables. The first multi-day event of the Wynn Summer Classic attracted 2,427 runners for the $1,100 $1 million guarantee. 251 players made the money and top two prizes were chopped between Kwun Li and Dominic Coombe. The pair earned $280,594 and $266,639, respectively, for their two days of play. Coming in third was past MSPT Venetian champion Thomas Boivin. In June 2016, the Belgian outlasted a field of 2,887 to chop with Mukul Pahuja and earn $352,153. This time around, Boivin cashes out for $149,961. Ian O’Hara and Upeshka De Silva are among the other final tablists. The Wynn’s schedule lists one more $1,100 $1 million event starting on June 26 with three starting flights available. The $50,000 Poker Players Championship is the highest buy-in mixed game event on the schedule but ARIA added a matching event of their own for 2018. The $25,000 8-Game mix on June 14 attracted 30 entrants and featured quite a few players who entered the PPC the next day. Phillip Sternheimer and 2017 PPC winner Elior Sion chopped for $275,000 and $220,000 at a final table that included Luke Schwartz, Isaac Haxton, and Alexander Kostritsyn. All five players rolled over their cash into the PPC but none made the money in the year’s pinnacle mixed event.